When searching for life, scientists first look for an element key to sustaining it: fresh water. Although today’s Martian surface is barren, frozen and inhabitable, a trail of evidence points to a once warmer, wetter planet, where water flowed freely. The conundrum of what happened to this water is long standing and unsolved. However, new research published in Nature suggests that this water is now locked in the Martian rocks. 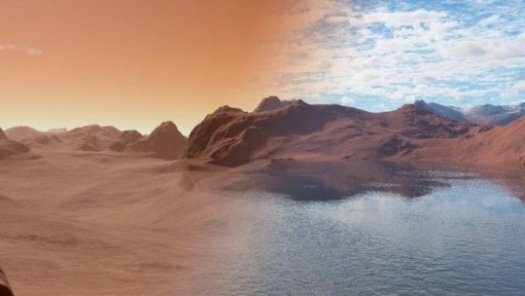 Scientists at Oxford’s Department of Earth Sciences, propose that the Martian surface reacted with the water and then absorbed it, increasing the rocks oxidation in the process, making the planet uninhabitable. Previous research has suggested that the majority of the water was lost to space as a result of the collapse of the planet’s magnetic field, when it was either swept away by high intensity solar winds or locked up as sub-surface ice. However, these theories do not explain where all of the water has gone. Convinced that the planet’s minerology held the answer to this puzzling question, a team led by Dr Jon Wade, NERC Research Fellow in Oxford’s Department of Earth Sciences, applied modelling methods used to understand the composition of Earth rocks to calculate how much water could be removed from the Martian surface through reactions with rock. The team assessed the role that rock temperature, sub-surface pressure and general Martian make-up, have on the planetary surfaces. The results revealed that the basalt rocks on Mars can hold approximately 25 per cent more water than those on Earth, and as a result drew the water from the Martian surface into its interior. Dr Wade said: ‘People have thought about this question for a long time, but never tested the theory of the water being absorbed as a result of simple rock reactions. There are pockets of evidence that together, leads us to believe that a different reaction is needed to oxidise the Martian mantle. For instance, Martian meteorites are chemically reduced compared to the surface rocks, and compositionally look very different. One reason for this, and why Mars lost all of its water, could be in its minerology. The overarching message of Dr Wade’s paper, that planetary composition sets the tone for future habitability, is echoed in new research also published in Nature, examining the Earth’s salt levels. Co-written by Professor Chris Ballentine of Oxford’s Department of Earth Sciences, the research reveals that for life to form and be sustainable, the Earth’s halogen levels (Chlorine, Bromine and Iodine) have to be just right. Too much or too little could cause sterilisation. Previous studies have suggested that halogen level estimates in meteorites were too high. Compared to samples of the meteorites that formed the Earth, the ratio of salt to Earth is just too high. We know that Mars once had water, and the potential to sustain life, but by comparison little is known about the other planets, and the team are keen to change that. Dr Wade, said: ‘To build on this work we want to test the effects of other sensitivities across the planets — very little is known about Venus for example. Questions like: what if the Earth had more or less iron in the mantle, how would that change the environment? What if the Earth was bigger or smaller? These answers will help us to understand how much of a role rock chemistry determines a planet’s future fate.